The police today seized 60 kg of poppy husk (worth Rs 24 lakh) during a naka near Kila Raipur. 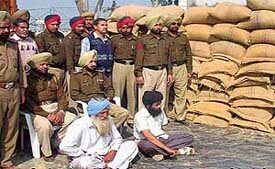 The naka was laid by a police party headed by Mr Harjit Singh Brar, DSP, Dakha. The Shiv Sena held a protest against Valentine's Day celebrations. They burnt 'vulgar cards' at Baba Than Singh Chowk here today. They marched from Shingar Cinema to Baba Than Singh Chowk. The protest rally was led by Mr Anil Sahni Monu. Finally launching a crackdown on violators of the Supreme Court directive on noise pollution, the city police booked a resident for playing music after 10 pm yesterday. The division number 7 police arrested Varun Sood, a resident of Phase-I, Urban Estate, Dugri, for flouting the SC directive and District Magistrate's orders. He was released on bail. The Civil Surgeon of Ludhiana, Dr Rajinder Kaur, saved an adult barn owl, which had developed injuries after its wings were entangled in a kite string. The owl was found hanging on a tree with wings injured badly. The doctor offered water to the owl and then reported about it to the local chapter of the People for Animals (PFA). The Indo-Pak cricket series always give rise to strong emotions. But this time, viewers are just taking it as another cricket match. Gone are the days when restaurants and hotel owners presented waiters in cricket dress and menu and crockery in the cricket gear to attract customers. Senior Bharatiya Janata Party leader and former Rajya Sabha member Lala Lajpat Rai today questioned the Prime Minister’s stand on the issues like Bihar and voting against Iran at the International Atomic Energy Agency (IAEA) meet. The office of Employees Provident Fund Organisation, Bathinda, finished the first phase of issuing the National Social Security Number cards (NSSN) to thousands of employees from seven districts falling under the circle, claimed Mr P.R. Mitra, Commissioner of the organisation. He distributed documents among heads of various industrial units of the area at a function organised at Gillanders Arbuthnot and Company Ltd at Akbarpur, near here, on Friday. The Excise and Taxation Department will clear all VAT refunds in the state within three weeks. The department has already disbursed refunds to the tune of Rs 41.65 crore, said Mr D.P. Reddy, Excise and Taxation Commissioner, Punjab, here recently. Punjab Agricultural Management and Extension Training Institute, PAU, has organised a six-day national training programme on “Efficient management and use of water resources for sustainable agriculture”. It was sponsored by the Ministry of Water Resources. People of the Dalit community are fed up with the false promises of the Congress government in the state and they will participate in the chetna rally to be organised by the Shiromani Akali Dal (SAD) at Kartarpur on February 18, said Mr Dalip Singh Pandhi, former minister and member of the SAD advisory committee to mediapersons. Earlier in the day he addressed a meeting of Akali workers on the compound of the Canal Rest House. In a meeting held by office bearers of the Sikhya Vibhag Class IV Government Employees Union here today, the body president, Mr Harbhajan Singh, said they had decided to hold a protest meeting on February 14. Ectopia-2006, a three-day cultural festival organised at Dumra Auditorium of Dayanand Medical College and Hospital (DMCH) concluded here last evening. On the third and final day, performances of the participants added flavour to the event. The Science Club of the local Dyanand Adarsh Vidyalya High School organised a science fair on the school premises yesterday. The inaugural function of the fair was presided over by Ms Kusam Meddireta , Principal, while Mr Vijay Hind, Director, Hind Hospital, was the chief guest. Mr Harnam Dass Johar, Education Minister, has asserted that to check the menace of copying during the Punjab School Education Board examinations strict vigilance would be exercised. More than 70 physically handicapped persons were provided artificial Limbs by the Bharat Vikas Parishad Charitable Trust at a camp organised in coordination with all its Ludhiana branches here today. In India about 200 million people of all ages have sleep problems and more than 80 sleep-related disorders have been identified. These interfere with quality of life and contribute to many types of accidents.